STATE OF ISRAEL Ministry of Defense Coordination of Government Activities in the Territories. 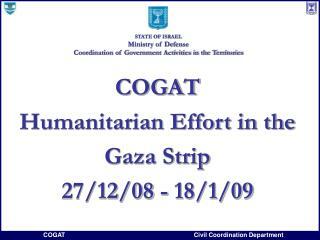 COGAT Humanitarian Effort in the Gaza Strip 27/12/08 - 18/1/09. Border with Egypt:12.5 km. 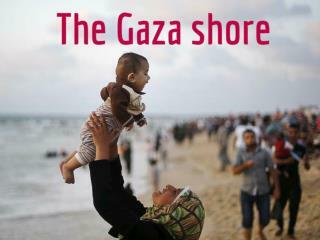 The Gaza Strip 43.6 km. The Green line: 57.3 km. 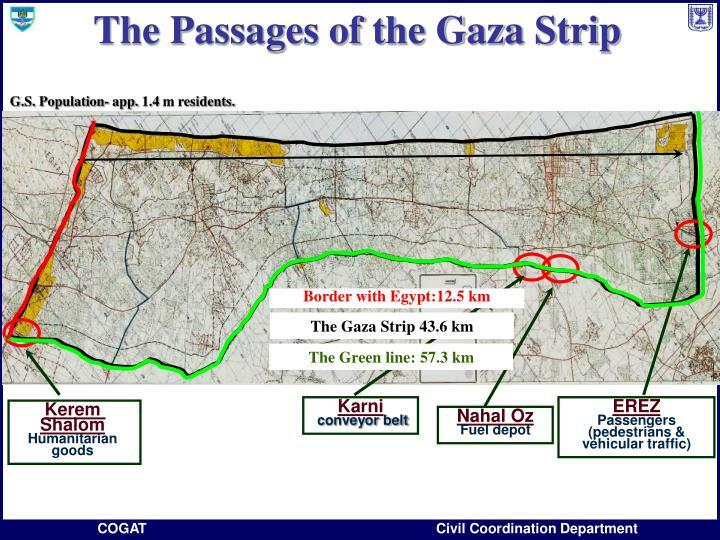 The Passages of the Gaza Strip. G.S. Population- app. 1.4 m residents. Following the security cabinet’s decision on Saturday evening (Jan.17) to accept the Egyptian proposal and the announcement that Israel would hold its fire, measures were taken by the IDF in order to implement this decision. At 2 A.M (18.1) – Israel holds its fire. 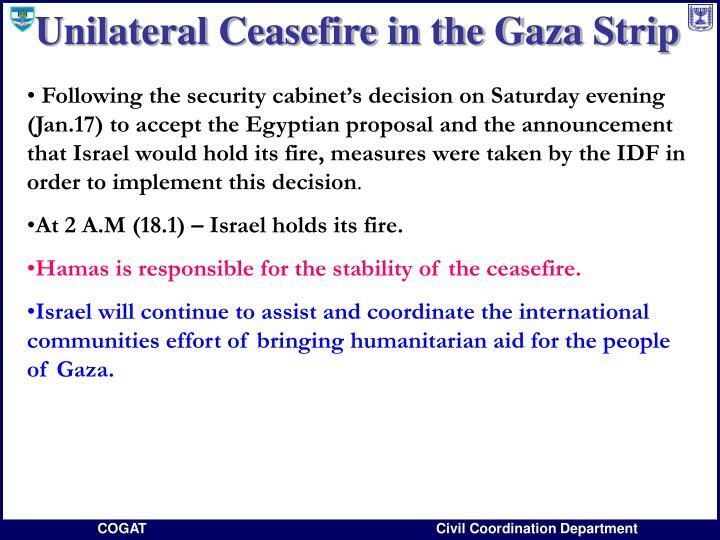 Hamas is responsible for the stability of the ceasefire. 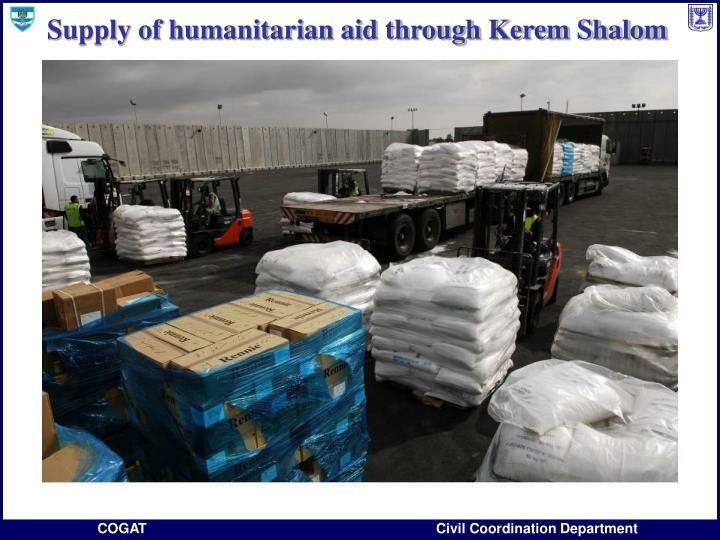 Israel will continue to assist and coordinate the international communities effort of bringing humanitarian aid for the people of Gaza. 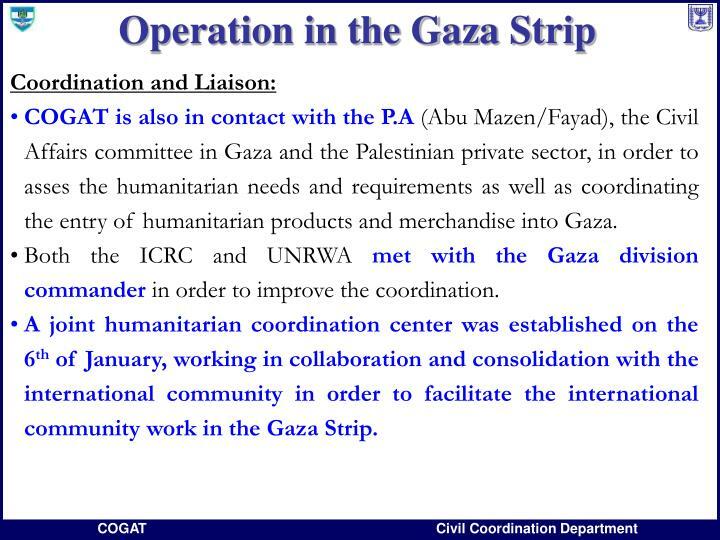 COGAT is also in contact with the P.A (Abu Mazen/Fayad), the Civil Affairs committee in Gaza and the Palestinian private sector, in order to asses the humanitarian needs and requirements as well as coordinating the entry of humanitarian products and merchandise into Gaza. Both the ICRC and UNRWA met with the Gaza division commander in order to improve the coordination. A joint humanitarian coordination center was established on the 6th of January, working in collaboration and consolidation with the international community in order to facilitate the international community work in the Gaza Strip. 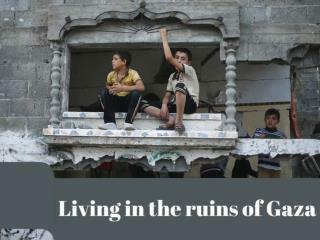 Open contacts and a 24 hour "hot line" with the International Organizations (UNRWA, ICRC, WHO, WFP, etc.) 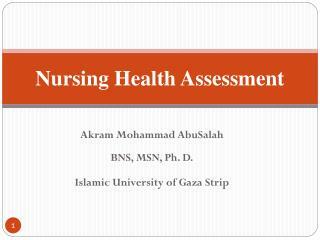 was established in order to evaluate and coordinate the humanitarian needs and requirements, throughout the operation. 120 COGAT officers were present at the IDF operational levels in order to ensure the continuation of the humanitarian effort conducted by Israel. 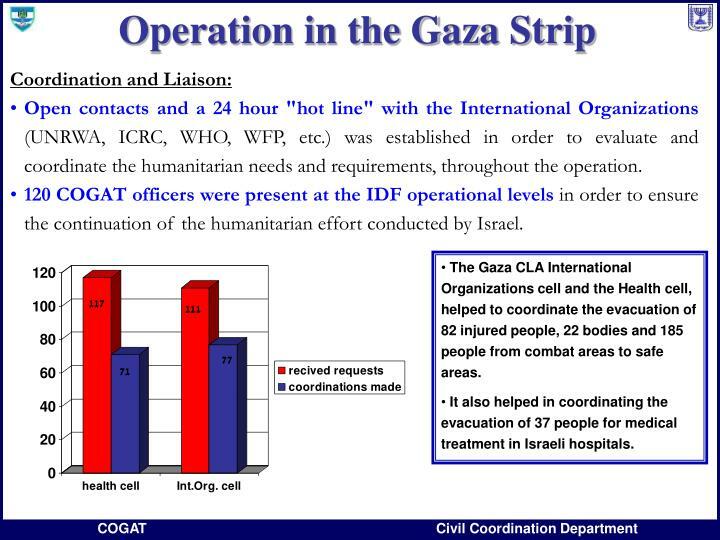 The Gaza CLA International Organizations cell and the Health cell, helped to coordinate the evacuation of 82 injured people, 22 bodies and 185 people from combat areas to safe areas. 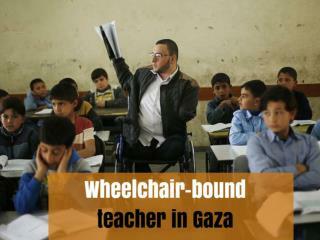 It also helped in coordinating the evacuation of 37 people for medical treatment in Israeli hospitals. Evacuation of a 9 year old child for medical treatment in Israel from the combat area. Evacuation of 5 handicap Palestinians from the fighting in Izbat Aba to Jabalia. Coordination of food assistance to an isolated family in north of Gaza. 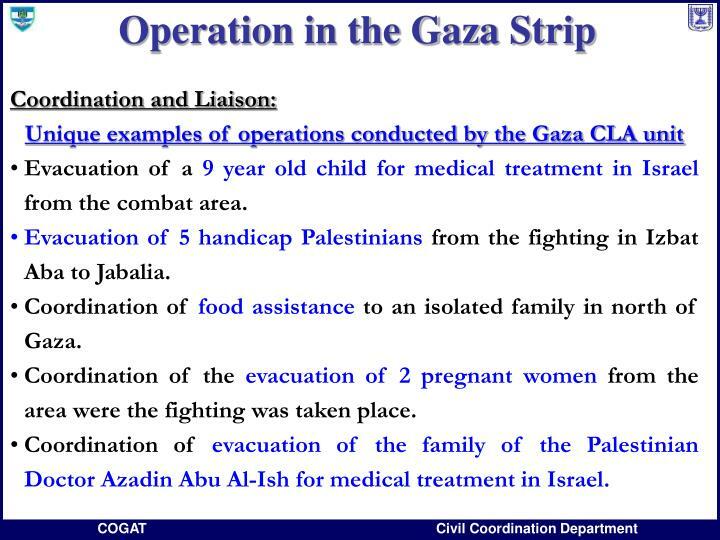 Coordination of the evacuation of 2 pregnant women from the area were the fighting was taken place. Coordination of evacuation of the family of the Palestinian Doctor Azadin Abu Al-Ish for medical treatment in Israel. 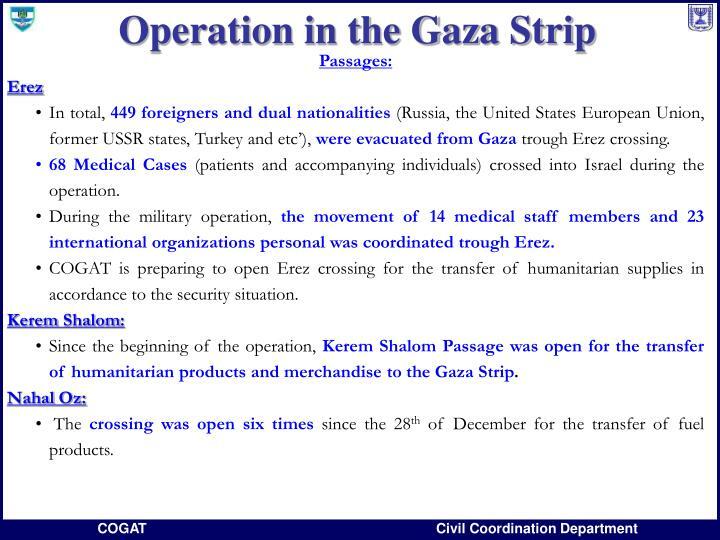 In total, 449 foreigners and dual nationalities (Russia, the United States European Union, former USSR states, Turkey and etc’), were evacuated from Gazatrough Erez crossing. 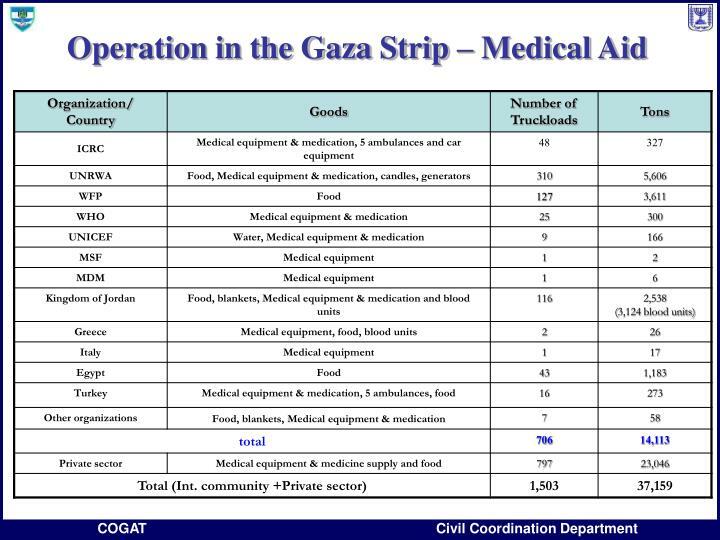 68 Medical Cases (patients and accompanying individuals) crossed into Israel during the operation. During the military operation, the movement of 14 medical staff members and 23 international organizations personal was coordinated trough Erez. 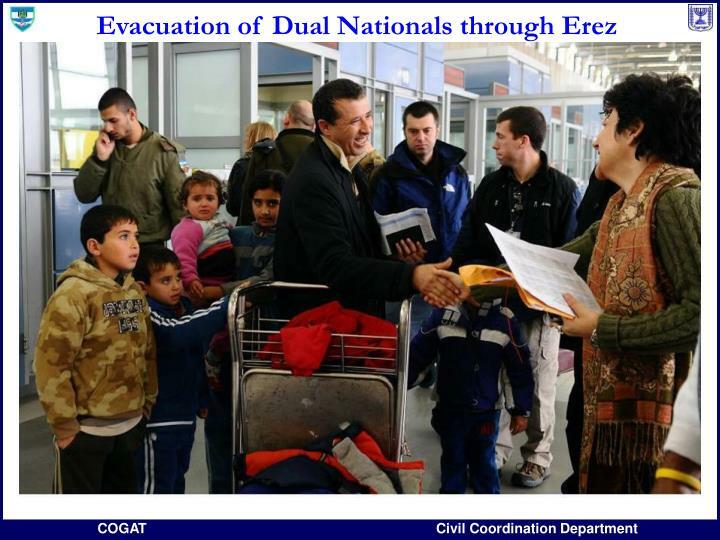 COGAT is preparing to open Erez crossing for the transfer of humanitarian supplies in accordance to the security situation. 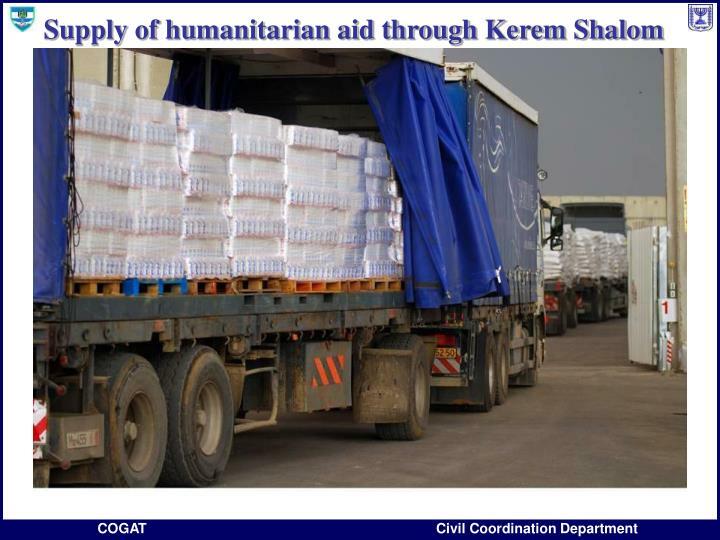 Since the beginning of the operation, Kerem Shalom Passage was open for the transfer of humanitarian products and merchandise to the Gaza Strip. The crossing was open six times since the 28th of December for the transfer of fuel products. 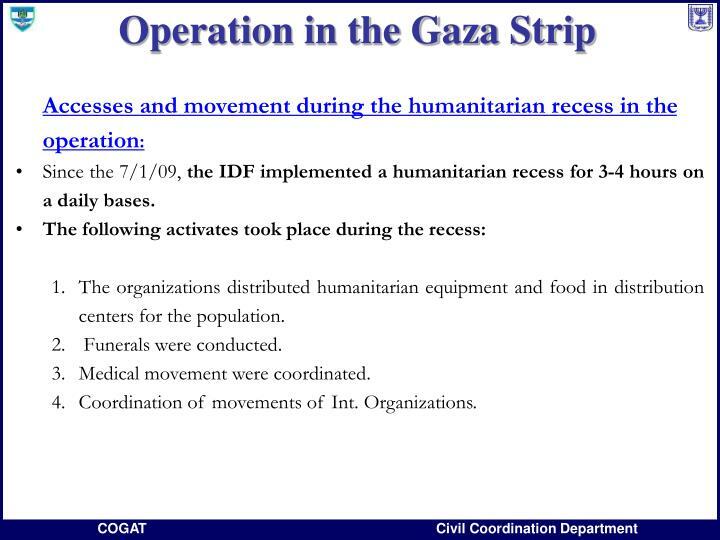 Since the 7/1/09, the IDF implemented a humanitarian recess for 3-4 hours on a daily bases. The organizations distributed humanitarian equipment and food in distribution centers for the population. 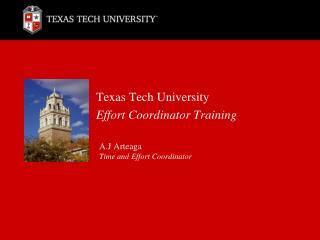 Coordination of movements of Int. 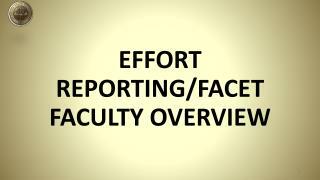 Organizations. 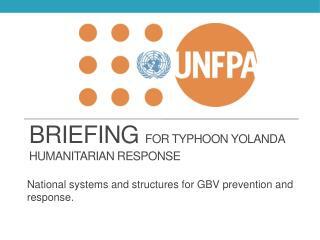 Priority is given to humanitarian supply in accordance to the needs raised by the Int. 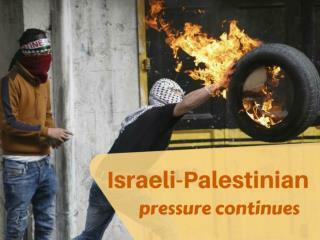 community and the Palestinian civil affairs committee . 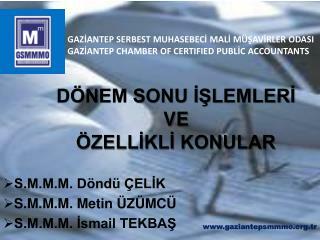 Israel intends to expand and continue the transfer of fuel and gas to the G.S. 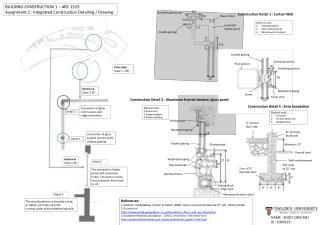 (As an alternative for the fuel transfer through Nahal Oz crossing when closed). 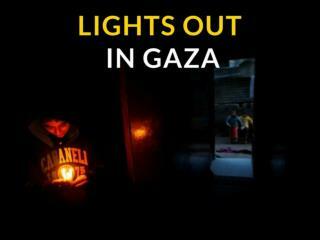 Before the operation, Gaza received 70% of its usual electrical supply, due to lack of fuel. 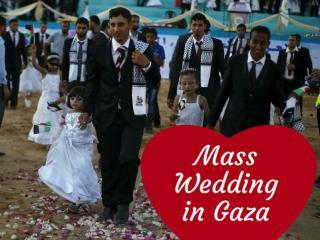 From those 70%,Israel supplied 62% (124 MVA supplied in 10 lines from Israel) and Egypt 8%( 17 MVA supplied by 2 lines). During the first days of the operation, due to damages caused by the fighting, the supply of electricity was reduced to 25%, by the end of the operation electricity supply reached 77% (19/1). During the operation 9 out of 10 lines from Israel were damaged. 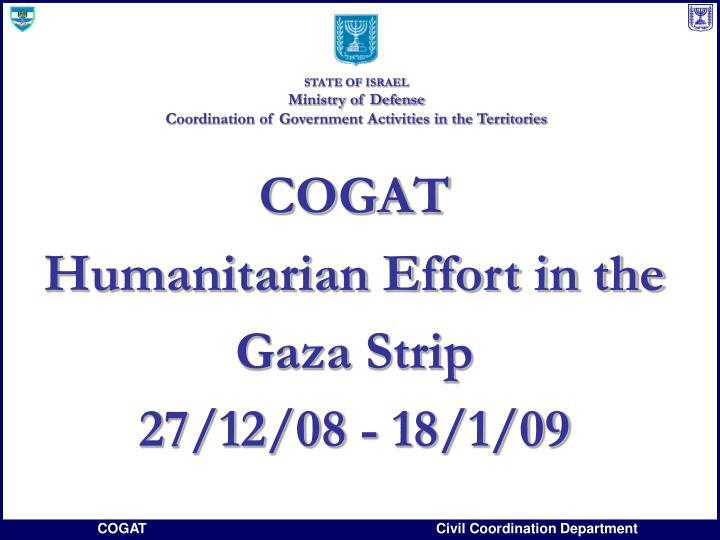 By the end of the operation, and with the help and coordination of COGAT, all but one damaged line were rehabilitated. One of the two lines from Egypt were damaged and was fixed twice during the operation. 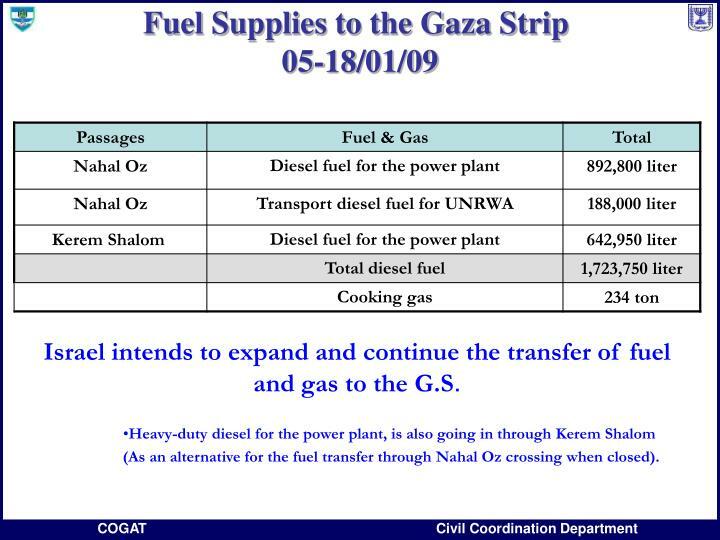 On the 10.1.09, the Gaza power plant resumed its activity and is now producing 25-30 MVA. As of the 19.1.09: electrical supply is 77%. 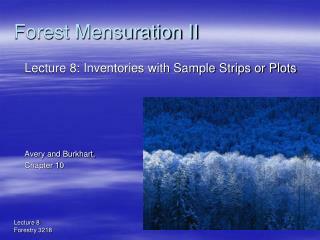 (7% more than when the operation started). 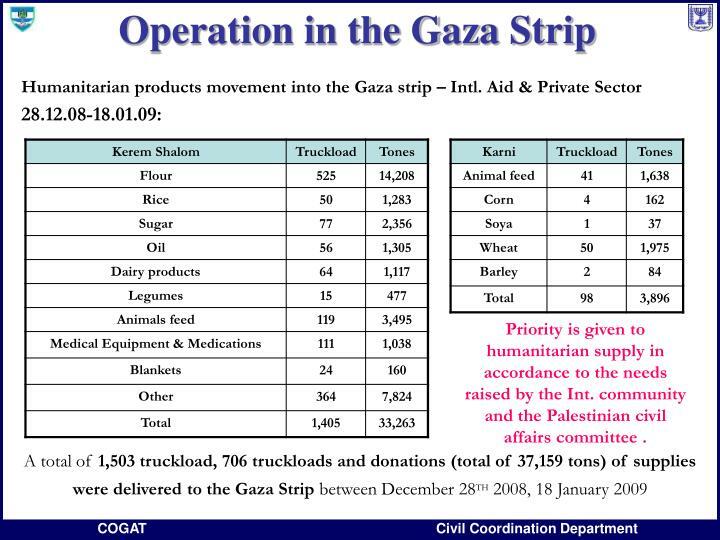 Due to the lack of electricity in the first days of the operation, some of the pumps and wells stopped operating, in order to meet the needs, 4 trucks with 98 tons of personal water bottles were transfered through Karem Shalom into Gaza on the 11.1.09. 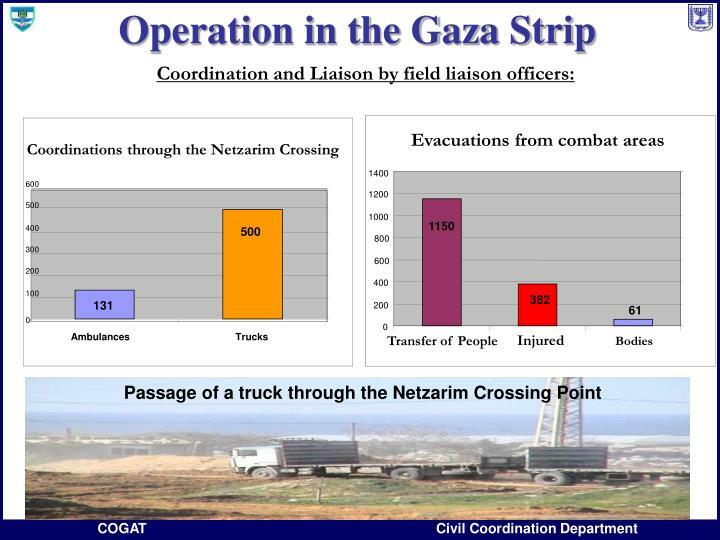 On 13.1.09, 5 trucks with equipment for the water infrastructure transferred into Gaza. On the 15.1.09, the pump in the damaged waste water treatment plant in Shikh-Ajlin was supplied with fuel. 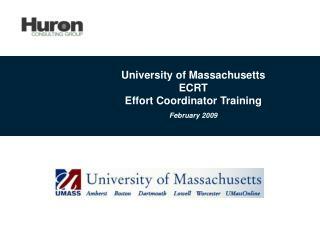 On the 18.1.09, a CMWU team was coordinated to the area in order to fix the damage. 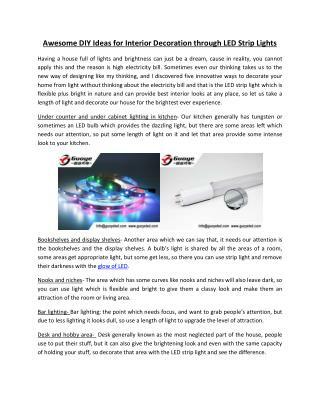 The communication problem in Nahal Oz was fixed. 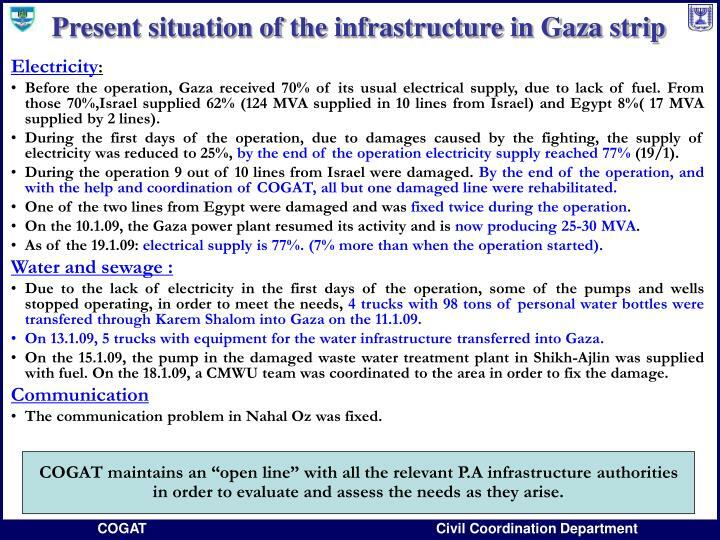 COGAT maintains an “open line” with all the relevant P.A infrastructure authorities in order to evaluate and assess the needs as they arise. Time and Effort Basics From Commitments to Certification and Everything in Between -. 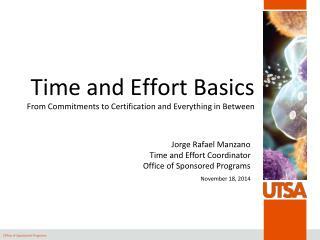 jorge rafael manzano time and effort coordinator office of sponsored programs october 9, 2009. 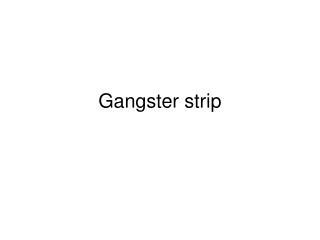 STRIP -. u školi. ići ćemo. hajdemo kućama pa ćemo se naći kod zgrada. idemo li danas u park??. u školi. dolazak kući. mama.dobio sam 5 iz hrvatskog. mogu li za nagradu ići u park?. 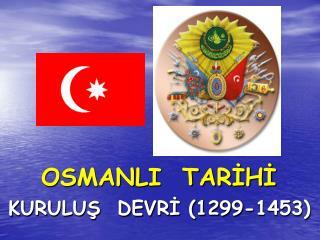 bravo sine! možeš, ali prvo nešto pojedi. 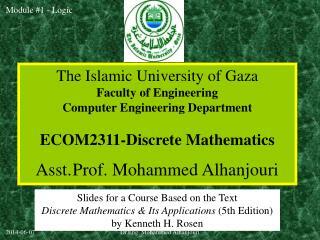 The Islamic University of Gaza Faculty of Engineering Computer Engineering Department ECOM2311-Discrete Mathematics Asst -The islamic university of gaza faculty of engineering computer engineering department ecom2311-discrete mathematics asst.